Got leftover matzoh? Make a decadent dessert! This buttery toffee is topped with caramel and sea salt for an irresistible treat. I gave myself an unexpected gift over the weekend. I single tasked. 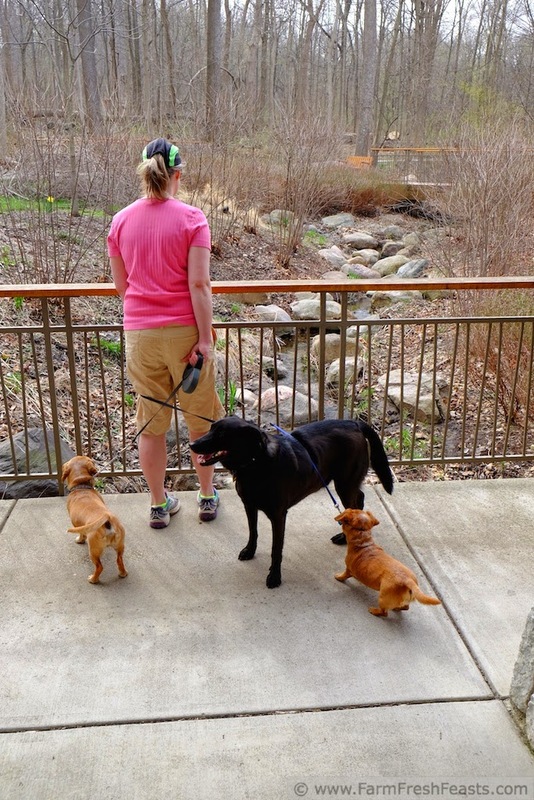 I single tasked the activity of enjoying nature. 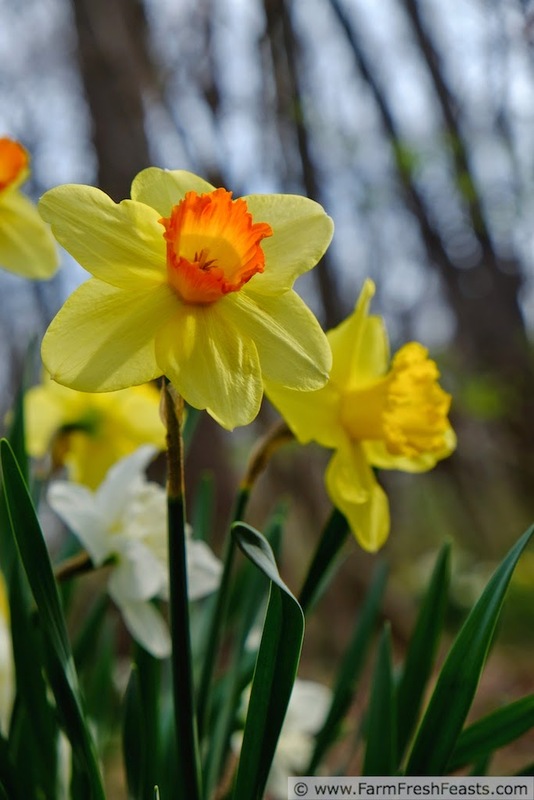 After a busy morning of cooking followed by a walk in the woods while my spouse photographed the daffodils [all of these flower photos are his, I was just the dog wrangler--which, lemme tell you, 3 zippy leashes is HARD!] followed by errand running--I found myself sitting in the grass next to Crystal the Composting Guinea Pig. I'd brought out with me my copy of MELT [so I could see what I needed in addition to the Humboldt Fog cheese I picked up at the store earlier], my phone [since I hadn't even checked email yet that day], and some sun tea. While Crystal moved methodically through the clover I quickly scanned both the cookbook and the unread emails then started to play a game on the phone. It was a gorgeous morning and all of a sudden it hit me. I needed to put down the phone and just experience the warm sun on my prone body, the tickly grass underneath me, and the sound and feel of the breeze. I lay in the grass in the warm sunshine like I haven't done in probably 30 years. And when Crystal's maid my daughter came to let us know the cage was ready, I felt refreshed. As I write this, though, I'm sitting on the porch with a Wee Oliver Picklepants in my lap. His good eye is scanning the yard for pretty, but he's not budging from his comfy perch so all the birds that are enjoying the Spring are safe. I've regained a bit of that peace. Spend sometime outdoors when you can. Single task while you're doing it. Preheat oven to 350 degrees Fahrenheit. 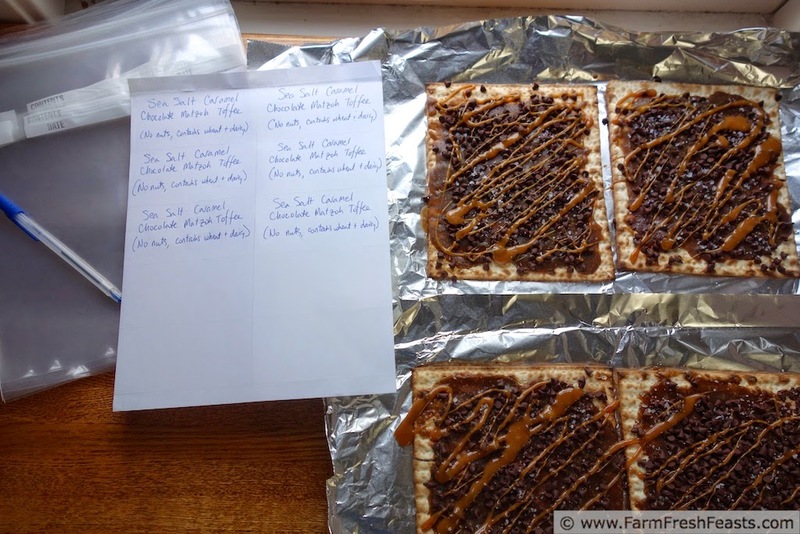 Line a rimmed baking sheet with foil, spray with oil spray, and place matzoh on top. I could not fit all the matzoh on my baking sheet, so I made another "rimmed sheet" out of foil and put that on a cookie sheet. It worked fine. In a small saucepan over medium high heat, melt butter and brown sugar. Bring to a boil and let boil for a minute, then pour over prepared matzoh. Place in preheated oven and bake for 5 minutes, then remove from oven and sprinkle with chocolate chips. Turn off the oven, and return the sheets to the cooling oven for 2-3 minutes until the chocolate chips are shiny and softened. Spread the melted chocolate [I use an offset spatula, picked up at a craft store with a 40% off coupon] evenly across the top of the sheet. In the same saucepan over medium heat, stir the unwrapped caramels and water until melted. 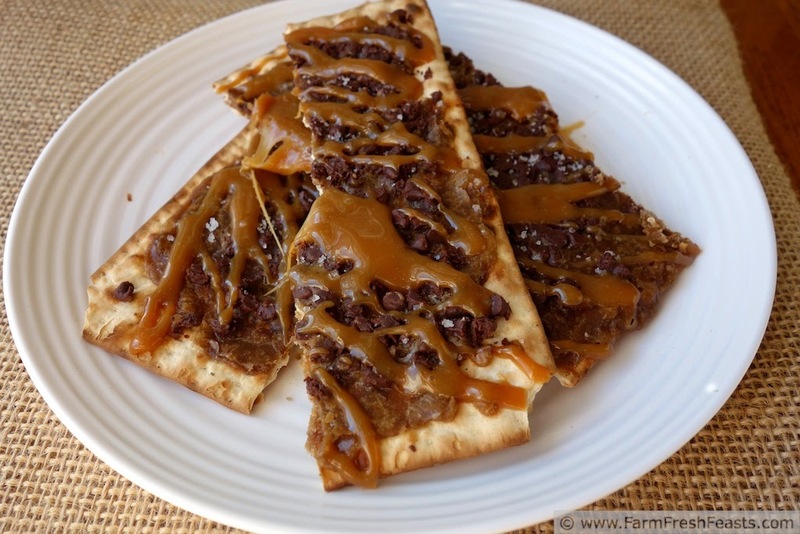 Drizzle the caramel over the matzoh toffee and sprinkle each piece with a healthy pinch of sea salt. Set aside to cool. I brought some to a bake sale, with one piece of matzoh in each gallon size zip top bag. 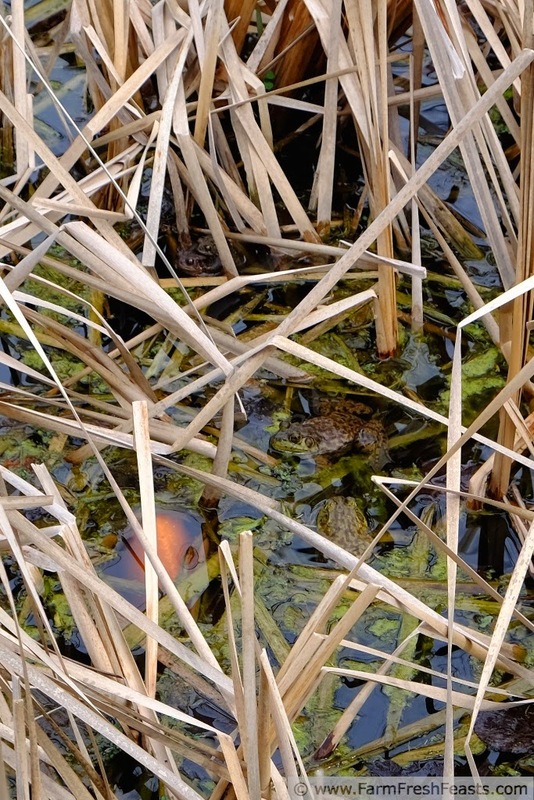 How many frogs can you find in this post? Saw this at whats cookin wednesdays and had to come over for a better look. Pinning this deliciousness! Thanks for stopping by, Danielle! I appreciate the pin--Pinterest is yet another area I need to spend more time on. That and the duster . . . ;) but it's too much fun to make yummy treats! I know how many frogs *I* saw. But I won't ruin it for others. 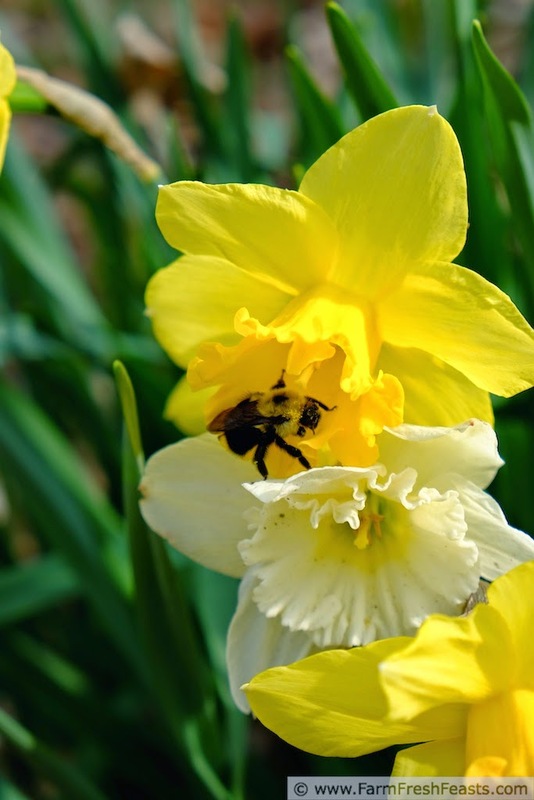 I love that shot plus the bee in the daffodil. I am still waiting for my toffee though. Yumm. I will pick up after-Passover marked down matzoh soon to make more, but if I've got none left will saltines do? I've shared with the spouse your compliments. More frog photos coming, we ran across a very cooperative frog yesterday. I so hear you with single-tasking. You hit the nail on the head – I don't think most of us know how to do that anymore. You captured the moment so well that I almost felt a little peace just reading it. Now if it only weren't chilly and cloudy today! 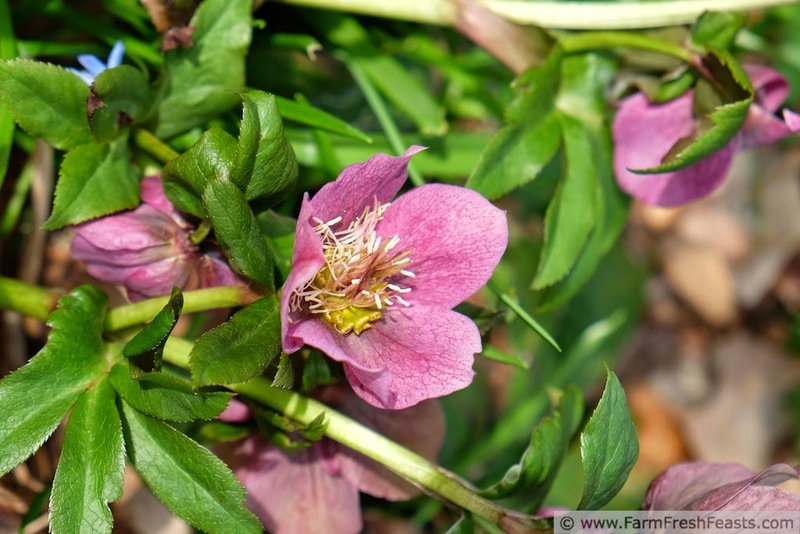 This weekend I will single task a bit in the yard when it is warmer! I know, I know I could do the same in the house, but I want to soak up some sun. :) I will make a cup of tea later and enjoy it on the couch for a chilly day single tasking moment. I'm so glad to pass along a little peace! Of course there was a thick layer of wet snow on my grassy spot less than 48 hours after I soaked up the sun, but that's par for the course this Spring. This looks like a version of a matzoh brittle I make about once a year, and it's sooooo good!! 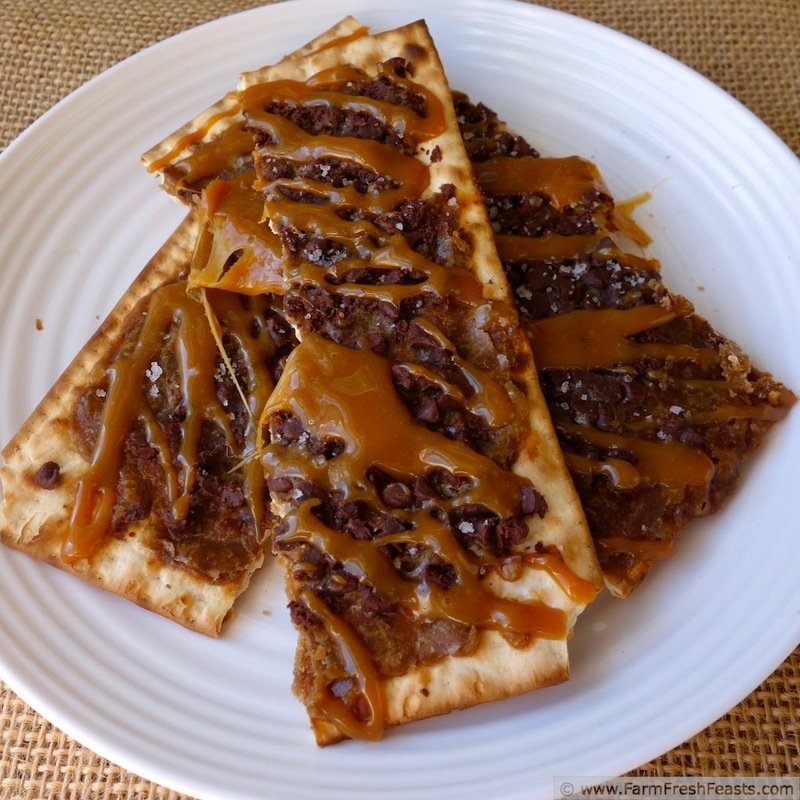 In my version you pour the caramel over the matzoh, then melt chocolate chips on, then melt peanut butter in the microwave and swirl it in; then break it up when it cools. And THEN, I put the little chunks into vanilla ice cream. To die for! I love the look of yours though - they almost look like pop tarts, lol! Oh, Julie, that sounds wonderful! I just searched your site and didn't see the recipe--so anytime you're ready to post it lemme know, ok? More ice cream is on the summer agenda, along with trying out my new pizza grill stone and lots of layered vegetable appetizers. Awesome, thanks, Julie! Making ice cream, and herbed cream cheese spread, and grilled pizza, is on my Summer To Do list! You've just landed yourself in the 2 for 2 category Kirsten! You've supplied us with a complete meal, cocktail and now sweets for Fiesta Friday...thank you! Why thank you! I haven't got the Cheater Margarita Smoothie recipe up yet, but boy the recipe testing is fun! Last night for our Fiesta Friday we had Banana, Blueberry, and Raspberry Margarita smoothies and they rocked. Recipe will be up for next Fiesta Friday! Something else to do with Matzoh? YES PLEASE! Save me some of this at the party; I can never get enough FF sweet treats! Yum, this sounds great. 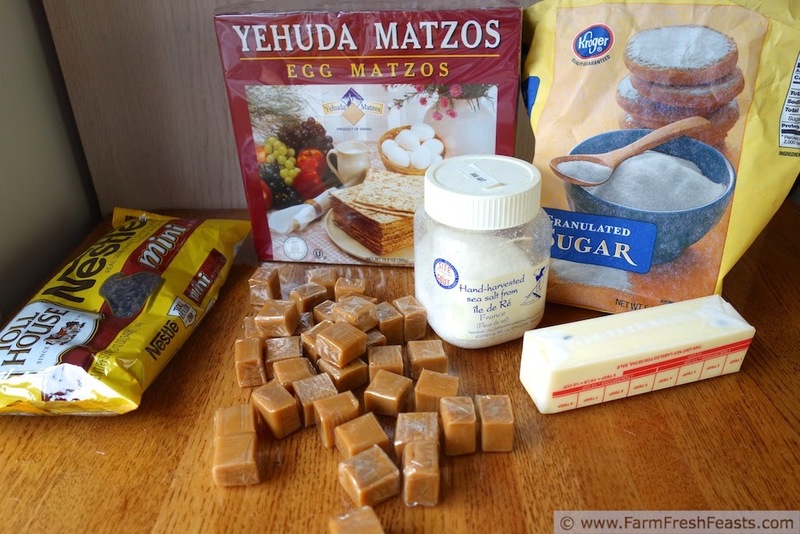 Please come share your matzoh at the Anything Goes linky, if you have not already. While the flower photos were beautiful, I love the last one with the dog leases wrapped all around your legs. I am double tasking right now: sitting outside soaking up the sun while I read blogs. I single tasked yesterday by doing a 10 minute meditation in an outside sun patch. Basically, I'm doing my best to slow down and soak it all in this long weekend. 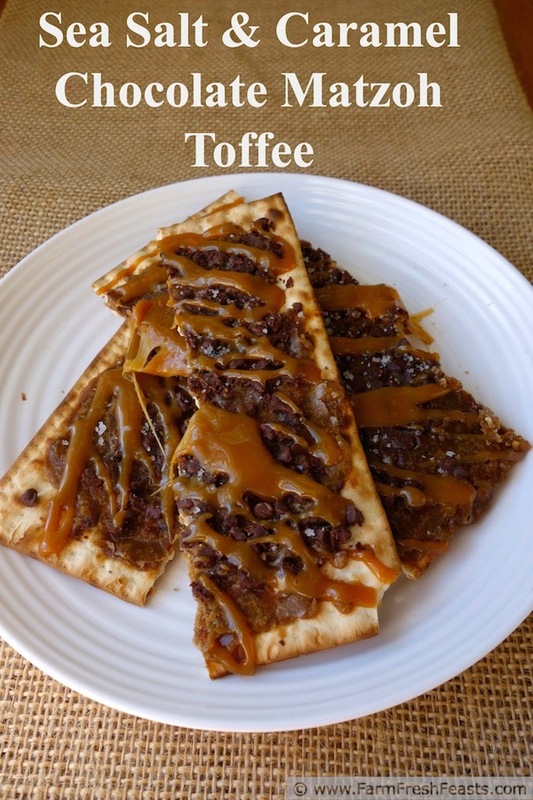 I took some time off so I'm enjoying four full days of relaxation followed by a week long blogging staycation, which is neither here nor there when it comes to sea salt, caramel and chocolate matzoh toffee. I would love these. I spend time deep cleaning my screen porch earlier this week, and now I'm enjoying the fruits of those labors. Love that porch, love it filled with plants, love it with a wiener dog or two in my lap while I read. I'd also love these, but sadly I have none. In my house, we call this "matzoh crack", because it's so addictive. Yep, this cracker crack stuff never lasts long. I have to make it when I know I'm giving most of it away, otherwise I will sit and snack on it! This looks so tasty :X Amazing pics you have here !